NOTE: This photo is not Sandra Bullock, but rather, a healthcare shopper seeking assistance online. Over the holidays, my daughter and I watched a newly-released Netflix movie, ‘Bird Box.’ Other than having Sandra Bullock as the lead actress, I knew nothing about the film. The plot of this show, without issuing a spoiler alert, is that some unknown force mysteriously destroys the earth’s population, and the only certainty of survival is to not ‘see’ this evil. To remain alive, survivors must cover their eyes from the evil that chases them. One small peek can spell doom for those curious. In this riveting movie, having blindfold vigilance is the difference between life and death. Recent findings in the January issue of the Health Affairs journal reveals that higher costs, not better patient care, serve as the primary explanation on why the U.S. spends much more on healthcare than other developed countries. Researchers found that U.S. healthcare spending was $9,892 per person in 2016, about 25 percent more than second-place Switzerland, which averaged $7,919 per person. Our neighbor to the north, Canada, is less than half of what we spend, $4,753. The drivers for this enormous cost chasm, according to this article, is that the U.S. has higher drug prices, higher salaries for doctors and nurses, higher hospital administration costs and, yes, higher prices for many other medical services. Despite these costs, Americans have less access to many healthcare services than residents of other developed countries. A perfect storm, we might say. I have reported similar findings in a prior blog. To make matters worse, the same study indicated that in 2015, there were 7.9 practicing nurses and 2.6 practicing physicians for every 1,000 Americans, compared to OECD medians of 9.9 nurses and 3.2 physicians. The long-term prospects of our numbers improving are not promising. Also in 2015, the U.S. had only 7.5 new medical school graduates per 100,000 people, considerably less than the median of 12.1 in developed countries. Certainly, there must be some good news to share with you, right? Yes…and no. The prices we pay for hospital care, clinics, surgery centers, and prescribed medications, are usually unknown until sometime AFTER the interaction – typically following review and payment by our insurance vendor. The healthcare infrastructure gives much lip service to patient centricity, but follow through is underwhelming, to put it mildly. Transparency is extremely important these days because most Iowans and Americans are required by their health plans to pay higher deductibles and co-pays when seeking medical care. Beginning January 1, the Centers for Medicare and Medicaid Service (CMS) is attempting to force price transparency by requiring all hospitals to post their list prices online. Under this arrangement, hospitals are required to publish a list of their standard charges online in a “machine-readable” format and to update this information at least annually. Hospitals are currently required to make this information publicly available or available upon request. On the surface, this appears to be a hopeful beginning for all shoppers – and it is. However, when I look at hospital websites in Iowa and elsewhere, mandated compliance is far from patient centric. Using two of the largest hospital systems in Des Moines as proof – Mercy Medical Center and UnityPoint – we have a long way to go before price transparency nirvana can be reached. The Mercy ‘Cost Estimator’ tab begins with a disclaimer that any costs published are nothing more than ‘estimates.’ The price-shopping patient must first click the “I Agree” button before being allowed to advance to the next page, which is sort of a magical mystery tour (special thanks to Lennon and McCartney). This page shows a similar disclaimer that all prices are mere ‘estimates,’ (special thanks this time to lawyers and marketing). In the left margin, we find links to a dozen ‘body systems’ that will allow price-shoppers to analyze procedures, median charges, various percentile charges, MS-DRG/CPT and Codes. This spreadsheet shows 40,054 charge description masters (CDMs), which are incomprehensible medical procedures that are a hodgepodge of numbers and technical medical terms. One example is the 46040 4405 Abscess I&D Ischiorect, which has a charge (before discounts) of $10,936. Huh? In fairness to Mercy Medical Center, largely due to their repeated disclaimers, my expectations for finding value were set reasonably low. Put another way, I would not use this website as a shopper, as it is absolutely meaningless. Hospitals provide this data (and the gibberish language that comes with it) only because they are federally required to do so, not because they have a profound desire to empower patients. Have you ever bought a non-medical product or service using ‘estimated’ prices? I didn’t think so…nor have I.
UnityPoint’s ‘prices’ are found in the tab aptly labeled, ‘Patient Charges and Costs.’ On this page, the hospital does a reasonable job of explaining what the charges are…and are not. About halfway down this page the price-shopper can find two links that provide “Des Moines’s current charge information as of December 31, 2018,” in addition to “Des Moines’s standard Diagnosis-Related Group charge information as of December 31, 2018.” Each link will take the shopper to Excel spreadsheets that make little to no sense…even for someone like me, who makes a living using spreadsheets. UnityPoint also provides a link to Iowa Hospital Charges Compare, a website provided by the Iowa Hospital Association. In addition to comparing ‘estimated’ hospital inpatient services by selected Iowa hospitals, it also provides ‘estimated’ prices for outpatient surgery procedures. Trying to determine hospital prices in advance of a test, procedure or stay is daunting, frustrating and futile. This new hospital ‘transparency’ requirement is a very small step that needs a rocket boost into the 21st Century. What price-shoppers now see on hospital websites come from ‘chargemasters,’ which are massive compendiums of prices set by each hospital for every service or drug a patient receives. Historically, even hospital administrators can be flummoxed by how chargemasters are established. But the real issue is that each published price is nothing more than a ‘list’ or ‘estimated’ cost. Currently, most procedures are still being charged separately, and are not bundled together. In most hospital encounters, it is extremely difficult to determine whether additional procedures will be required PRIOR to the patient entering the hospital. On top of this, the negotiated price of any claim is determined by the third-party payer (e.g. insurance companies, self-funded plans, Medicare, Medicaid, etc.) the shopper uses. Additionally, hospital location and the shopper’s specific health plan features (deductibles, coinsurance, etc.) will also determine the final cost. Here’s a novel concept: Instead of pricing their services using the ‘horseshoes and hand grenades’ approach, hospitals could take the initiative and partner with ‘motivated’ insurance payers to develop a patient-friendly tool that provides legitimate ‘real-time’ prices along with patient-specific health plan out-of-pocket calculators. This sounds much too simple, doesn’t it? To stay alive, Sandra Bullock needed to keep her blindfold close by before navigating outdoors. 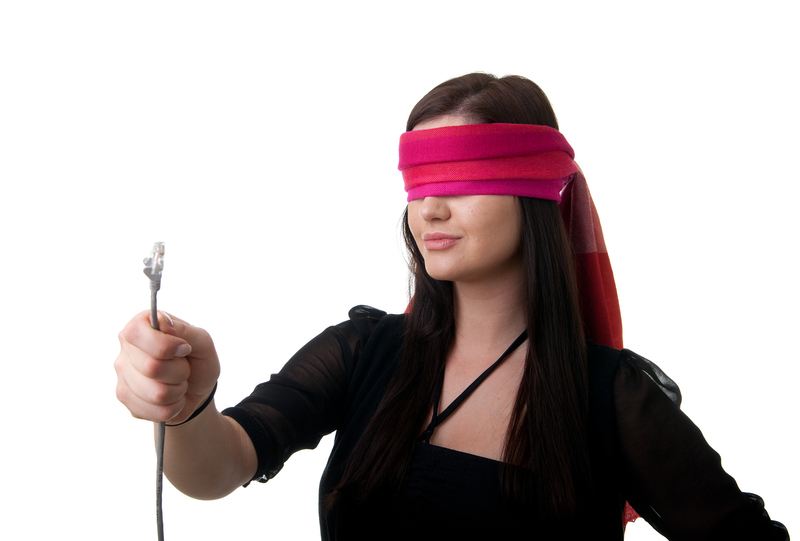 Healthcare shoppers, on the other hand, are trying remove their blindfolds to make appropriate decisions when seeking high-value healthcare. Unfortunately, to maintain the status quo, the current healthcare infrastructure works very hard to keep the blindfolds tight and opaque. But, to do the right thing in healthcare, we must tear down the existing silos of self-interest that dominate the care that Iowans and Americans deserve – and pay for. Much work needs to be done to find this common good. By doing so, our blindfolds may finally be removed and clarity revealed.